Hi guys, looking for a gunsmith that would be good to send my super Blackhawk 5.5” 44 mag to work on accuracy. Cutting forcing cone, trigger job kind of thing. I’m new to single actions so whatever they normally do to them to enhance accuracy. I target shoot, deer, and bear hunt with the gun. Send it to Ruger. They’ll do it for free, and make the gun perfect. Did two of my Blackhawks last year. Came back, perfect lockup, timing and zero endshake. There are a number of things you can do yourself that will improve accuracy without the need to send it to a smith. #2 While it will not give you a perfect trigger, if you lift one of the trigger spring legs off the post, under the grip, it will help lighten the trigger weight. Another option is a spring kit from Wolf. They offer a complete kit for the blackhawk that will reduce the trigger pull weight. #3 A hammer and trigger shim kit is super easy to install and will help smooth up the feel of the trigger and prevent the hammer from dragging the frame and stealing energy from the primer hit. #4 A ton of dry firing. The Ruger single action trigger will slick up with more firing. Newer guns tend to be a bit rough, however with enough shooting or dry firing they slick up pretty nice. Not as good as a custom trigger job, but pretty nice none the less. If you are set on sending the gun out, I would recommend that you sent it to a smith that specializes in single actions. A blackhawk trigger is not hard to clean up if you have the correct tools and jigs. If you don't is it is very easy to make the firearm unsafe. I can't think of anybody in Eastern PA who I would recommend of single action work. There probably are decent smiths out there, however there are also a ton of guys who really don't know what they are doing. Another point to consider is your timeline. If you want to have the gun available for this season, now is not the time to send it out. Most decent smiths have a wait time of several months to get work done. If you find one that says he can turn it around in a couple of days then I would question why he has that much time in his schedule. Wyatt at Enck's Gun Barn has done work on my wife's single actions and several of my dad's guns. He does good work. Highly recommend him. I guess it depends on your baseline. What problems are you trying to solve? Are you having accuracy problems? What kind of ammo are you using? Super Blackhawks have a pretty good reutation for accuracy, they won a lot of IMHSA championships back in the day. That being said, probably the first thing would be a real action job. All of my Blackhawks have benefitted form trigger work but I do not used reduced power mainsprings. The lock time of a single action revolver is already long and a reduced power spring just makes it worse. A properly prepared trigger does not need reduced power springs. Six shots at 25yds using a Blackhawk in 41 mag. The only changes are a proper trigger job and a reflex sight. The other thing all of my Blackhawks have are upgraded sights, I just can't use the factory rear sight. I prefer the Bowen Rough Country sight over all others, it gives a nice clean sight picture. I just had trigger work done on two of my Rugers, a Flat Top Blackhawk and a Single Six by Mark Hartshorne at Pinnacle High Performance in Quakertown. Fair pricing and quick turnaround. Wow thanks for all the reply’s guys! Yes right now I would say I’m having some accuracy issues. I’m not the best shot in the world but I’m decent, and right now my 5” 629 and 2.5” Alaskan shoot circles around this thing. Iv tried all sorts of different handloads and factory loads. Maby I’ll try contacting Ruger first as it could be a factory problem and then I’ll look into everything you guys suggested and probably go one of those routes as well. I appreciate all the replies and hopefully I’ll have this thing driving tacks with everyone’s advice! Before you send your gun back, have someone who is a more experienced single action shooter shoot it. 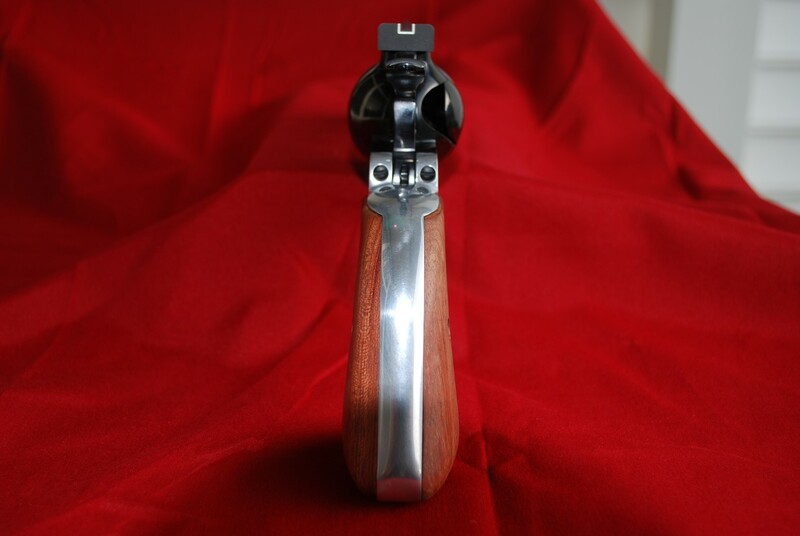 While I don't doubt your ability to shoot well, the single action grip is much more sensitive to grip pressure than one of the double actions like your 629 or Alaskan. The other thing to try is to fire it off of sandbags and see how it groups. If things look good off the bags then grip pressure is likely a contributing factor. Don't ignore chamber throats (the ID of the cylinder chambers at the front end of the cylinder). Some Ruger revolvers have had issues with chamber throat diameters being smaller than what they should be, effectively swaging down the bullet diameter a touch smaller than groove diameter. Also, in some cases S&W and some Ruger revolvers have had chamber throats larger than they should be, and the bullet is like a broomstick in a bathtub passing through the end of the cylinder and into the forcing cone. I had a 6" S&W Model 25-5 in 45 Colt that had chamber throats oversize by 0.005" and accuracy suffered. Contrast with a 4" pre-lock S&W Model 625 Mountain Gun in 45 Colt that had throats that matched bullet diameter within 0.0005" and it is a tackdriver. I had a Ruger Redhawk 45 Colt 4.2" that had undersize throats by about 0.003", shot patterns, and send the cylinder to a 'smith that reams throats. When reamed, that Redhawk shot as if laser-guided. Gotcha, iv been practicing my grip with the gun and it feels to point more natural now, but I was shooting from a rest about half the time. I was also just reading up on having the cylinder reamed and no matter what I do I think I would like to get one of those Bowen sights suggested, and put a dab of paint on the front sight as it is hard to pick up sometimes for me. Thanks for all the help guys, I’ll get something figured out over the next couple months. What kind of ammo are you using? What kind of groups at what distance? You mention sending it back to Ruger. What are you thinking they need to fix? Have you measured the cylinder throats?